Dublin Cycle Chic, here we come! I'm arranging a Cycle Chic bash in Dublin in a little over a month. Together with The Royal Danish Embassy in Ireland, Dublin City Council and the Department of Transport. Alchemy Events is arranging the cool gig. The date? 16 June 2010. The venue? Dublin City Hall. Git yer stilettos sharpened and yer cravats ironed. Dublin Cycle Chic. Photo by Cian Ginty on Flickr. The Cycle Chic event will be held in association with the Dreams on Wheels exhibition and we'll take it one step further. A groovealicious party celebrating Cycle Chic and that fine and good transport option, the humble and gorgeous bicycle. 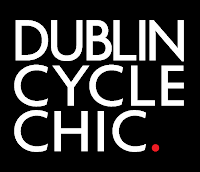 We've just launched the Dublin Cycle Chic Flickr group and I'd like to invite people to send in photos of Dublin Cycle Chic. In the week before the Dublin Cycle Chic party I'll choose the ones that most adhere to the Cycle Chic pathos and happily dish out some tickets to the event to the winners. Dublin Cycle Chic. Photo by Norbert Malone on Flickr. Get snapping. Get documenting the blossoming return of the bicycle - and cycle chic - to the streets of the Irish capital. I'm looking forward to going to Dublin to celebrate the possibilities. Let's say that this is the goal. 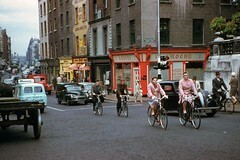 These photos are from Dublin, 1961. Citizen Cyclists on bicycles, in style. 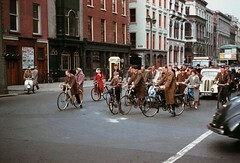 Vintage Dublin Cycle Chic, if you will. This is where we're headed. You're coming to Dublin on Bloomsday? The world is going to read your blog and wonder at the quaint old-fashioned cyclists in Dublin. They'll assume everyone here always dressess in outlandish Edwardian costume and cycles around on delivery-boy bicycles with outsized baskets. Brilliant! Leaving Dublin tomorrow. Really surprised and impressed with the unexpected cycle-friendly ambient here. Chic-ism is also present. Nice job folks! I can't believe my eyes! 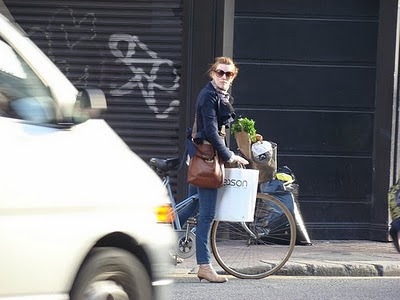 I have been reading your blog for months and always dreaming the day when bicycle will be more acceptable in Dublin. And then you are coming over!!! It will be a fabulous event and good PR for Dublin cycling crowd. (We really need that here, drivers are not totally used to the idea of cyclist YET! I am sure they will after your event!) I can't wait I can't wait I can't wait. Looking forward to the Cycle Chic Show and meeting Mikael. We are few Danes here in Dublin. This is great!! How does it work with attending the event? Looking forward and loving your blog. I do think there's a lovely growing cycling trend in Dublin. I know there certainly is around city center/south side.. I'm TOO excited!